Mark Curtis’s new book was published on 1 July 2010 and updated in 2018. Read The Guardian‘s coverage of the book, 6 July 2010, here. Read Mark Curtis’s Guardian article, 6 July 2010, here. Read reviews here (Independent), here (Metro), here (New Humanist) here (Asharq al-Awsat, in Arabic) here (Al-Masry Al-Youm, in Arabic) here (Morning Star) here (Tribune) here (Socialist Review) here (History Today) here (GreenLeft) here (New Statesman) here (Executive Magazine) here (New Internationalist). Listen to interviews with BBC Radio Scotland here and with RTE Radio 1 (Ireland) here (latter interview begins at 1hr 15 mins). Read an online interview about the book here. 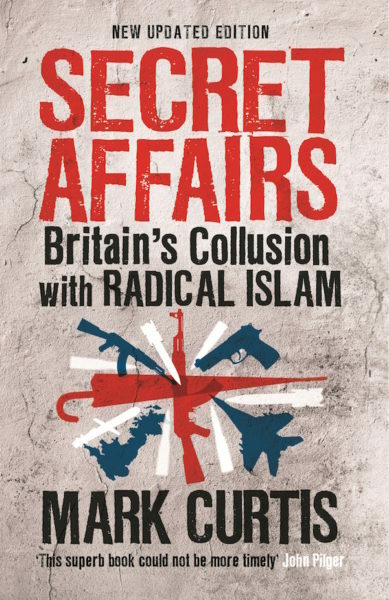 Mark Curtis’ new book recounts the history of British collusion with radical Islamic and terrorist groups. Truth has sprung out thanks to Mark Cutris book but why now and not before?I think it’s too late.The British soldiers killed so far in Afganistan and Iraq are the fatal consequences of the bad game the UK has played. The British peoples, and White peoples generally, are far more the victim of those strategies than today’s African and Asian peoples, excepting the Palestinians (clue there to the ultimate controlling interest and motive). As usual, Mark has provided reams of evidence which shows the lies and deciets that successive UK (and many others to be honest) governments have been promoting as truths for decades. The UK and US governments have been lying consistantly for so long that it seems that they know not how to tell a truth, assuming they ever did. Please read Mark’s other books as they are brilliantly sourced to conter the obvious lies that will be thrown at fans of his. Some wonderful work and research here, somewhat frightening though, but it is better we know as it helps to make sense of the nonsense. Whichever the way you percive Islam there is a need to share it with others. I was reminded about Mark Curtis’ work by re-reading John Pilger’s TELL ME NO LIES, where he included an excerpt from WEB OF DECEIT. I am now interested in discussing a proposal for action with citizens of any nation respecting a proposal for action designed to help people to self-educate and move in solidarity following a fresh paradigm in the electoral arena (which blends a new model for direct action). Please contact Richard Oxman at 12Citizens@gmail.com, if interested in discussion, etc. I am in California in the U.S., but — again — citizens of any nation can be on board with the game plan; it would help immeasurably to generate ongoing positive publicity for Mark Curtis’ work.